Key [diplomatic] missions in Dhaka are coordinating their efforts to respond to the ongoing political crisis. The primary vehicle for cooperation is the “Coffee Group,” which includes the US, UK, Canadian, and Australian chiefs of mission, the United Nations representative, the Head of the European Commission Delegation and the German Ambassador (representing the European Union presidency). Japan is also invited as the situation warrants. The group meets frequently on an ad hoc basis. [these diplomatic mission] have agreed to coordinated actions prior to scheduled elections on January 22, including meetings with the general secretaries of the two main parties. Other steps to be taken in Bangladesh and by the respective capitals and headquarters are under discussion. Without prejudice to their privileges and immunities, it is the duty of all persons enjoying such privileges and immunities to respect the laws and regulations of the receiving State. They also have a duty not to interfere in the internal affairs of that State. All official business with the receiving State entrusted to the mission by the sending State shall be conducted with or through the Ministry for Foreign Affairs of the receiving State or such other ministry as may be agreed. However, no government — neither the BNP, Jamaat led alliance government, nor the current Awami League led grand alliance government, let alone Fakhruddin-Moeenuddin’s regime — has expelled any such diplomat, or requested the home countries to recall them for their flagrant violation of the Vienna Convention. Demands to do so, were voiced by some quarters, it was reported in several dailies, particularly in the case of the UN resident representative Renata Dessallien (more about her later, for she’s a very special case), but hey, that was during the emergency period, when it was the consortium government that ruled. Macch ki ar maccher matha khaey? The fish does not devour its own head, does it? Since their visits mostly have to do with complaining about other parties, other leaders, with backbiting, with trying to impress, influence, lobby, inch close, curry up, the combined effect has been to install western diplomats/donors in the position of mediator, one which, in all likelihood, the latter relish, inflating as it does, their sense of self-importance. 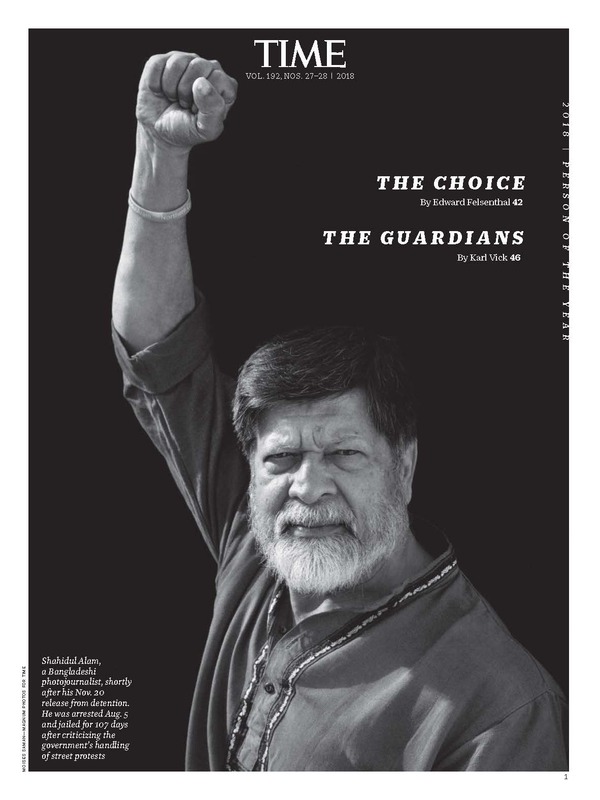 But setting aside personal foibles and egos, which are in any case, contentious matters, what is at stake is that this pilgrimage of sorts has, on the one hand, instituted the nations that the ambassadors represent as murubbis, while Bangladesh, on the other, is constructed as politically immature, a brown child lost in the wilderness, in need of adult guidance from white elders. Eerily reminiscent of colonial times, it is a tragic reminder that while the people fought hard for their independence, not once, but twice, their leaders lack the pride and dignity needed to uphold it. But to return to the central question: why do I think it is reasonable to assume that it was western “governments” (and, the UN resident representative) and not western “diplomats”? Because that would basically mean that a bunch of individuals had suddenly decided to throw overboard diplomatic conventions… and this is precisely where doubts creep in. It is true that no Bangladeshi government, thus far, has expelled any western diplomat or called on her/his respective government to recall her, because his behaviour — both actions and speech — broke all norms, but to turn to the coffee-drinking diplomats that Patricia Butenis writes about, surely, they themselves were aware of the gravity of what they were doing? 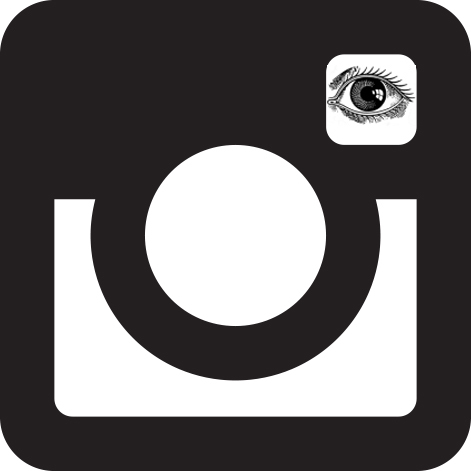 Surely, they were keenly aware that they were accountable to their own governments, unless… Unless, they had received a green signal from their own administration. Otherwise, why else would a whole bunch of diplomats suddenly decide to risk their careers, paychecks, pensions, promotions, hardship allowances, sending kids to college, paying mortgages, i.e., the social fabric of western, privileged, self-assured diplomatic lives? Surely, no amount of exaggerated self-importance, or ego-tripping could have outweighed the material advantages? For things to have been otherwise, one would need to be a Craig Murray. For readers who don’t know, Murray was the British ambassador to Uzbekistan (2002-2004), fired soon after a leaked report was published in the Financial Times, where he claimed that MI6 had used intelligence provided by Uzbek authorities gained through torture. He was recalled to London for disciplinary reasons, charged on 18 counts in August 2003. In January 2004, the Foreign and Commonwealth Office exonerated him on all charges after a four month inquiry, but reprimanded him for speaking to the media. In other words, to not toe their own government’s line, western diplomats stationed in Dhaka, would need to have had principles. To be men and women of conscience. The first shot on behalf of the consortium was fired by Renata Dessallien, the UN resident representative in the form of a press release which said that if the army went ahead and supported the electoral process through deployment during polls, despite lack of participation by all major political parties, its future role in UN peace-keeping operations, could be affected. It helped set the ball rolling. 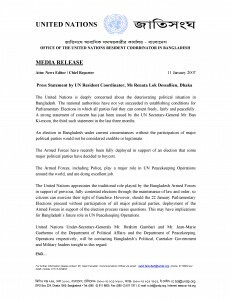 The United Nations appreciates the traditional role played by the Bangladesh Armed Forces in support of previous, fully contested elections through the maintenance of law and order, so citizens can exercise their right of franchise. However, should the 22 January Parliamentary Elections proceed without participation of all major political parties, deployment of the Armed Forces in support of the election process raises questions. This may have implications for Bangladesh?s future role in UN Peacekeeping Operations. United Nations Under-Secretary-Generals Mr. Ibrahim Gambari and Mr. Jean-Marie Guehenno of the Department of Political Affairs and the Department of Peacekeeping Operations respectively, will be contacting Bangladesh?s Political, Caretaker Government and Military leaders tonight in this regard. The existence of the press release was strongly denied by Ms. Dessallien, but I’ll come to that later. Its existence was an open secret, as a matter of fact, its up on UNDP Bangladesh’s official website, if you don’t believe me, go take a look,accessed 2:36, February 29, 2012. Several national dailies had called for her recall, New Age was one of them. 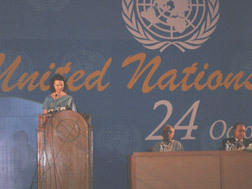 An editorial titled, “The UN Secretary-General Owes Bangladesh A Clarification” (November 2, 2008) pointed out that the official statement issued by the UN secretary-general’s spokesperson on Bangladesh in New York (Jan 10, 2007), had expressed concern at the deteriorating political situation in the country, had urged all concerned to “seek a compromise that will serve the interest of peace, democracy and the country’s overall well-being,” but had made no mention of Bangladesh army’s peace-keeping activities. [The] International community did not interfere in any way and the UN did not send any letter that apparently led to the postponement of January 22, 2007 election and declaration of state of emergency, said outgoing UN Resident Coordinator Renata Lok Dessallien. ?International community including the UN did not interfere in Bangladesh’s internal affairs…our only concern was to create a congenial atmosphere conducive to holding a free, fair and impartial election,? she said in an interview with The Daily Star. She categorically said the UN did not send any ‘special letter’ to the then Bangladesh government. ?There was no interference. There was continuous urge for accommodation,? she added. Renata, who is going to take up her new assignment in China after more than a three-year eventful tenure in Bangladesh, did not agree with former Army Chief General Moeen U Ahmed’s contention that Bangladesh Army personnel would have lost jobs in the UN peacekeeping mission if the army had played any role in the general election originally slated for January 22, 2007. ?This was never discussed,? Renata added. (“No letter from UN, no int’l interference. Outgoing resident coordinator Renata tells The Daily Star about post-emergency rumour in 2007,” Rezaul Karim, Daily Star, Sunday, April 18, 2010). 11. (C) The UN representative (protect) told the Ambassador that COAS Moeen had complained to her of the horrendous pressure he was under to step in, either under a State of Emergency or otherwise, and solicited a letter from the UN threatening loss of UNPKO duties should the military act extra-constitutionally. Moeen claimed that he could not “stick his neck out” and approach the President/Chief Adviser to beg off from any political role for the military without such benefit of proof of the dire consequences for the army. True, the identity of the “UN representative” is protected (albeit there is a telltale “her”), but it is not unreasonable to assume that general Moeen would hardly have settled for anyone less than the resident coordinator. It wouldn’t have cut any dice with president Iajuddin. The same WikiLeaks revelation was reported in the Daily Star as well, “UN warned army against coup. Leaked US cable discloses volatile situation in 2007 before president Iajuddin declared state of emergency” (September 7, 2011) but the report makes no mention of Renata’s exclusive interview to the Daily Star, where she had “categorically” denied a letter mentioning the “loss of jobs” in UN peacekeeping missions. Far less, does the daily consider apologising to its readers. Ms Dessallien’s posted in China now, she’s the UN Resident Coordinator and UNDP Resident Representative there. Big jump, eh? A reward? But for what? Lying through her teeth for sure, but for who? Why? Does this mean that America’s friendly khaki dictators — in Asia (Pakistan, Indonesia), Africa (Liberia, Nigeria), Middle East (Egypt), Latin America (Chile, Bolivia, Brazil), from the 50s right down to why till just last year (Hosni Mubarak) — are now out? Published in New Age, Thursday, March 1, 2012.